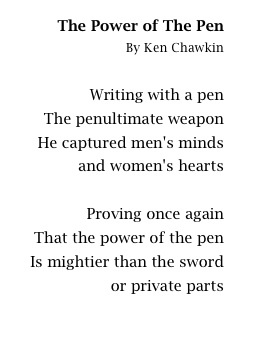 A random-assignment controlled study published today in Mind & Brain, The Journal of Psychiatry (Vol 2, No 1, pp. 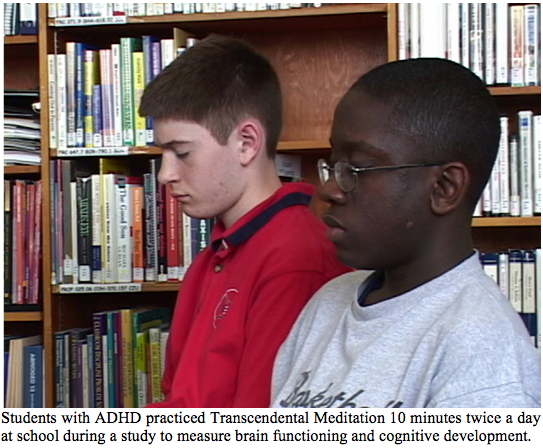 73–81) found improved brain functioning and decreased symptoms of attention-deficit/hyperactivity disorder, ADHD, in students practicing the Transcendental Meditation® (TM) technique. The paper, ADHD, Brain Functioning, and Transcendental Meditation Practice, is the second published study demonstrating TM’s ability to help students with attention-related difficulties. The first exploratory study, published in Current Issues in Education, followed a group of middle school students diagnosed with ADHD who meditated twice a day in school. After 3 months, researchers found over 50% reductions in stress, anxiety, and ADHD symptoms. During the study, a video was made of some students discussing what it felt like to have ADHD, and how those experiences changed after 3 months of regular TM practice. In this second study, lead author, neuroscientist Fred Travis, PhD, director of the Center for Brain, Consciousness and Cognition, joined principal investigator Sarina J. Grosswald, EdD, a George Washington University-trained cognitive learning specialist, and co-researcher William Stixrud, PhD, a prominent Silver Spring, Maryland, clinical neuropsychologist, to investigate the effects of Transcendental Meditation practice on task performance and brain functioning in 18 ADHD students, ages 11-14 years. The study was conducted over a period of 6 months in an independent school for children with language-based learning disabilities in Washington, DC. The study showed improved brain functioning, increased brain processing, and improved language-based skills among ADHD students practicing the Transcendental Meditation technique. A local TV news station reported on the study in-progress during the first 3 months. Students were pretested, randomly assigned to TM or delayed-start comparison groups, and post-tested at 3- and 6-months. Delayed-start students learned TM after the 3-month post-test. 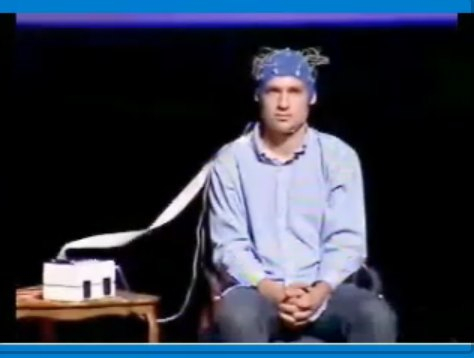 EEG measurements of brain functioning were taken while students were performing a demanding computer-based visual-motor task. Successful performance on the task requires attention, focus, memory, and impulse control. In addition, students were administered a verbal fluency test. This test measured higher-order executive functions, including initiation, simultaneous processing, and systematic retrieval of knowledge. Performance on this task depends on several fundamental cognitive components, including vocabulary knowledge, spelling, and attention. Using EEG measurements, the relationship of theta brain waves to beta brain waves can be diagnostic of ADHD. Dr. Joel Lubar of the University of Tennessee has demonstrated that the theta/beta ratio can very accurately identify students with ADHD from those without it. While theta EEG around 4-5 Hz is commonly associated with daydreaming, drowsiness, and unfocused mental states, theta EEG around 6-8 Hz is seen when one focuses on inner mental tasks, such as memory processing, identifying, and associating. “We chose the TM technique for this study because studies show that it increases brain function. We wanted to know if it would have a similar effect in the case of ADHD, and if it did, would that also improve the symptoms of ADHD,” said Dr. Grosswald. The Transcendental Meditation technique is an effortless, easy-to-learn practice, unique among categories of meditation. “TM does not require concentration, controlling the mind or disciplined focus—challenges for anyone with ADHD,” Grosswald added. Transcendental Meditation produces an experience of restful alertness, which is associated with higher metabolic activity in the frontal and parietal parts of the brain, indicating alertness, along with decreased metabolic activity in the thalamus, which is involved in regulating arousal, and hyperactivity. During the practice of the Transcendental Meditation technique, coherence is found across different EEG frequencies. After meditation, the brain utilizes this increased functioning ability to support the performance of a task in an integrated manner. Three months of TM practice resulted in significant decreases in theta/beta ratios and increased verbal fluency. This translates into improved executive function and more efficient cognitive processing. 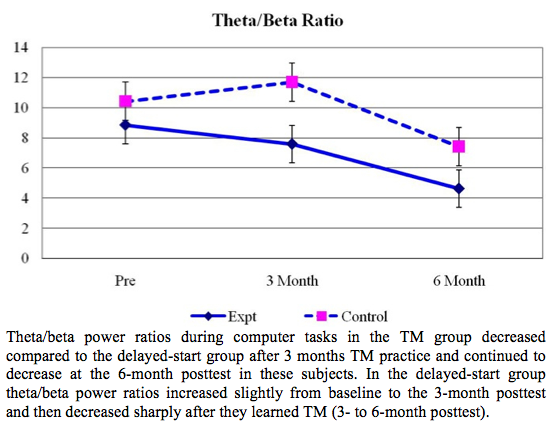 During the first 3 months of the study, the theta/beta ratios of the control group (delayed start) actually increased. After learning, and practicing TM for 3 months, this group experienced dramatic decreases in theta/beta ratios and increased verbal fluency as well. Students reported that the TM technique was enjoyable and easy to do. They felt calmer, less stressed, and better able to concentrate on their schoolwork. They also said they were happier since they started TM. This correlated with reports from the parents. 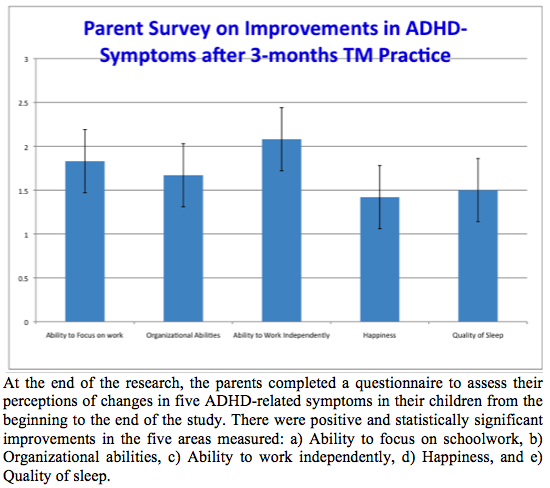 At the end of the research, the parents completed a questionnaire to assess their perceptions of changes in five ADHD-related symptoms in their children from the beginning to the end of the study. There were positive and statistically significant improvements in the five areas measured: a) Ability to focus on schoolwork, b) Organizational abilities, c) Ability to work independently, d) Happiness, and e) Quality of sleep. The combined results were significant. There was a 48% reduction in the theta/beta power ratios and a 30% increase in brain coherence after the 6-month period. Studies have shown that pharmaceuticals decrease theta/beta power ratios by 3%, and neurofeedback by 25%. “While stimulant medication is very beneficial for some of my clients with ADHD,” Stixrud added, “the number of children who receive great benefit from medicine with minimal side-effects is relatively small. The fact that TM appears to improve attention and executive functions, and significantly reduces stress with no negative side-effects, is clearly very promising.” Stixrud said he hoped these findings would lead to more research on the use of TM with children and adolescents. In conclusion, these findings warrant additional research to assess the impact of Transcendental Meditation practice as a non-drug treatment for ADHD, and to track meditating students’ improved academic achievements. The study was funded by a grant from the David Lynch Foundation. Attention-deficit/hyperactivity disorder (ADHD)—characterized by inattentiveness, impulsivity, and hyperactivity—is diagnosed in almost 10% of children ages 4-17 years, representing 5.4 million children. The Center for Disease Control and Prevention reported among children with current ADHD, 66.3% were taking medication for the disorder. In total, 4.8% of all children ages 4-17 years (2.7 million) were taking medication for ADHD. The majority of them stay on it into adulthood. The rate of prescriptions for Attention-Deficit/Hyperactivity Disorder in the U.S. has increased by a factor of five since 1991—with production of ADHD medicines up 2,000 percent in 9 years. The commonly used drugs for ADHD are stimulants (amphetamines). These drugs can cause persistent and negative side-effects, including sleep disturbances, reduced appetite, weight loss, suppressed growth, and mood disorders. The side-effects are frequently treated with additional medications to manage insomnia or mood swings. Almost none of the medications prescribed for insomnia or mood disturbances are approved by the Food and Drug Administration (FDA) for use with children. The long-term health effects of ADHD medications are not fully known, but evidence suggests risks of cardiac disorders and sudden death, liver damage and psychiatric events. It has also been found that children on long-term medication have significantly higher rates of delinquency, substance use, and stunted physical growth. The Transcendental Meditation technique is an effortless technique practiced 10-20 minutes twice a day sitting comfortably with the eyes closed. TM is not a religion or philosophy and involves no new beliefs or change in lifestyle. Over 350 peer-reviewed research studies on the TM technique confirm a range of benefits for mind, body and behavior. Several studies have compared the effects of different meditation practices and found that Transcendental Meditation provides deeper relaxation and is more effective at reducing anxiety, depression and hypertension than other forms of meditation and relaxation. In addition, no other meditation practice shows the widespread coherence throughout all areas of the brain that is seen with Transcendental Meditation. More information can be obtained by calling 888-LEARN-TM or visiting www.ADHD-TM.org, www.AskTheDoctors.com, or www.TMEducation.org. Some Media Coverage: PhysOrg.com: New study shows Transcendental Meditation improves brain functioning in ADHD Students, PsychCentral.com: Transcendental Meditation Lessens Kids’ ADHD Symptoms, eMaxHealth: Transcendental Meditation Improves ADHD Symptoms, Academic Skills, ADHD/ADD Natural Remedy Report: New study shows Transcendental Meditation improves brain functioning in ADHD students, GGN-Education News: New study shows Transcendental Meditation improves brain functioning in ADHD students, Part 2, Part 3, Part 4, Part 5; The Times of India: Transcendental meditation for the brain, Health24: Meditation boosts brain functioning, RedOrbit: New Study Shows Transcendental Meditation Improves Brain Functioning In ADHD Students, The Behavioral Medicine Report: Transcendental Meditation Improves Brain Functioning In Students With ADHD, Science News Line medicine, Science Codex, Transcendental Meditation Blog: New study finds TM boosts brain functioning and helps students with ADHD, GoodTherapy.org: Children with ADHD May Benefit from Transcendental Meditation, and many others. 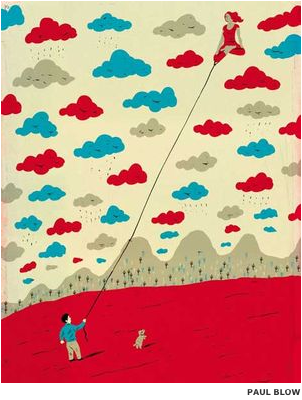 Could The Key To Health And Happiness Be Restoring A ‘Lost’ State Of Consciousness? A ‘Lost’ State of Consciousness? “Life happens within the realm of three, ever-changing phases: waking, dreaming and sleep. Yet most of us intuit that there’s more to human consciousness than what we ordinarily experience. Scientists have long known that each of the three major states of consciousness has its own distinct style of physiology and brain activity. Could there be a fourth major state of consciousness that likewise has its own physiological signature and brain pattern, a state that’s been overlooked or forgotten? What if the loss of this state were the cause for much of what ails us — personally and collectively? You are invited to comment and share this article with friends! You can also “fan” Jeanne by clicking next to her photo above the Huffington Post article and sign up for emails as new articles appear. Jeanne and her husband Tom Ball teach the TM Program in Asheville, NC. www.MeditationAsheville.org. You can follow them on Twitter: www.Twitter.com/MeditationAVL and Facebook: www.Facebook.com/MeditationAsheville. This excellent article is also posted on their website as: An Undiscovered State of Consciousness? 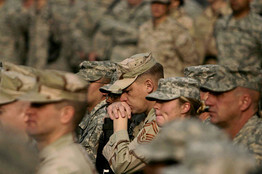 One study of soldiers showed a 50% reduction in symptoms after eight weeks of meditation. War wounds come in many forms. Some are obvious, such as scars, gashes and amputations. Others, the psychological ones, are less visible but equally devastating. The numbers in this second group are staggering: The military’s latest mental health survey of combat troops in Afghanistan found that 20%—one in five—suffer from post-traumatic stress disorder. People with combat-related PTSD often suffer from periods of emotional numbness and depression that may coexist or alternate with intense anxiety and delusional thinking. Their days may be afflicted by flashbacks to traumatic situations. Their nights are often disrupted by sleeplessness and nightmares, from which they awake drenched in sweat as though back on the battlefield. Clearly, there is a need for new, creative approaches: Transcendental Meditation, better known as TM, is a promising candidate. An ancient Vedic technique developed in India, TM was brought to the West in the late 1950s by Maharishi Mahesh Yogi. It involves sitting comfortably with eyes closed for 20 minutes twice a day while thinking a mantra. It does not require adherence to any religious belief system or ritual practices. Yet to date there are over 340 peer-reviewed papers describing the beneficial effects of TM on the mind and body. The David Lynch Foundation recently hosted an event to help raise funds to teach TM to our wounded warriors returning home from Iraq and Afghanistan. We heard from veterans of three wars: Jerry Yellin, a fighter pilot in World War II who flew 19 missions over Japan; Dan Burks, who served in Vietnam; and David George, a veteran of Operation Iraqi Freedom. Despite differences in age and wartime experiences, these men had two things in common: All suffered terribly from PTSD, and all experienced tremendous relief from TM. Life became once again peaceful and even joyful for them. What was clear from these men’s stories was how great a toll their symptoms took on their families, as well as on themselves. In a poignant video, Mr. George’s mother described the transformation of her son from a courteous young man into a hard-drinking, depressed and deeply disturbed veteran, who she feared would take his own life or someone else’s. All that changed when Mr. George began to meditate on a regular basis. According to Ms. George, TM saved her son’s life. In a study of Vietnam vets conducted by James S. Brooks and Thomas Scarano and published in the Journal of Counseling and Development in November 1985, TM outperformed the conventional psychotherapy of the day. More recently, a pilot study of five Iraq and Afghanistan veterans published in the June 2011 issue of Military Medicine showed a 50% reduction in PTSD symptoms after just eight weeks of practicing TM. There is a scientific basis for the observed benefits of TM for combat-related PTSD. In several studies, TM has been shown to buffer fight-or-flight responses, which are thought to be overactive in people with PTSD, as evidenced by their hypervigilance, anxiety and exaggerated startle responses. In addition, TM has been found to reduce blood pressure and decrease the risk of heart attacks and strokes—other conditions in which an overactive fight-or-flight response may play a role. In a similar manner, TM may modulate nervous system responses, thereby allowing affected veterans to relax and leave behind the traumas of war. Regardless of how TM helps, the mounting evidence leads to one conclusion: If a simple, low-cost technique like TM can substantially alleviate the suffering of even some of the thousands of veterans afflicted with PTSD, how can we afford not to give it a try? Mr. Lynch is a filmmaker and the founder of the David Lynch Foundation. Dr. Rosenthal is a clinical professor of psychiatry at Georgetown University Medical School and the author of “Transcendence: Healing and Transformation Through Transcendental Meditation” (Tarcher-Penguin, 2011). In “A Transcendental Cure for Post-Traumatic Stress” (op-ed, July 13) David Lynch and Norman E. Rosenthal pose a challenge for the federal agency entrusted with caring for our nation’s 23 million veterans: “If a simple, low-cost technique like TM can substantially alleviate the suffering of even some of the thousands of veterans afflicted with PTSD, how can we afford not to give it a try?” In fact, Transcendental Meditation has received substantial attention at the Department of Veterans Affairs, the Department of Defense and the National Institutes of Health. Indeed, meditation and other forms of complementary and alternative medicine are already used at VA to help veterans suffering from PTSD. We have embarked on a series of clinical investigations to evaluate all forms of meditation, TM among them, in order to determine whether this promising technique can produce results consistently for our patients, and which kind of meditation, from among several practiced widely today, would be most helpful to them. VA is beginning demonstration projects across the country in different care settings. We are looking for a simple, natural, culturally neutral and repeatable technique that can augment existing PTSD treatments. These studies require us to be open to new techniques for prevention and treatment, as well as structured in our approach to determining their value and efficacy. The studies already conducted, and those currently underway, are listed at http://tinyurl.com/3gx74o3. The promising personal experiences mentioned in the article and the dedicated efforts of our VA, DoD and NIH team offer us all hope for finding more effective treatments for PTSD. We can’t afford not to. The 33-track digital album “Download For Good: Music That Changes The World” benefits the filmmaker’s nonprofit organization which offers stress-reducing Transcendental Meditation to underserved populations. More than 30 artists representing multiple genres have contributed to a compilation benefitting the David Lynch Foundation, a not-for-profit educational organization founded by the iconic director which offers stress-reducing Transcendental Meditation to underserved populations including at-risk inner-city youth, U.S. veterans suffering from PTSD, the homeless and prisoners. Download For Good: Music That Changes The World features live cuts, remixes, covers (a highlight: Au Revoir Simone’s take on Don Henley‘s “Boys of Summer”) and original songs by the likes of Peter Gabriel, Moby, Alanis Morissette, Neon Trees, Arrested Development, Nancy Sinatra, Ozomatli and Maroon 5 along with a handful of curious collaborations. Among them: The Police guitarist Andy Summers with opera singer Geeta Novotny, who team up for “Ave Maria,” and the Johnny Cash-meets-Leonard Cohen lament “Won’t You Stay” by Pink Jaffee (AKA Ran Pink and Foo Fighters sideman Rami Jaffee) with Daryl Hannah (Jaffe’s girlfriend) and Jakob Dylan (Jaffe’s Wallflowers bandmate) on background vocals. The 33-song compilation is available exclusively at iTunes. See the full track listing below. Also see USA TODAY: David Lynch drops a musical compilation; NME: Tom Waits, Iggy Pop, Amanda Palmer for David Lynch’s meditation compilation, Alanis Morissette, Ben Folds, Moby also contribute to new release; Paste: David Lynch Releases Compilation Album for Charity; Icon vs. icon: Iconic Film Director Launches ‘Download For Good’; Star-Studded Digital Music Compilation; GAFFA: Stjerner støtter David Lynch-fonden, Tom Waits, Iggy Pop og Donovan har bidraget med numre til ny støtteplade; The Post Chronicle: David Lynch Teams With Stars For Charity Album; Express.co.uk: STARS LINK WITH LYNCH FOR CHARITY ALBUM; Kink: Tom Waits, Iggy Pop e.v.a. op TM verzamelalbum David Lynch; Female First: Stars Link With Lynch For Charity Album; Huffington Post: Amanda Palmer Discusses the Launch of David Lynch Foundation Music; contactmusic: Alanis Morissette – Stars Link With Lynch For Charity Album; spinner: David Lynch Releases Star-Studded ‘Download for Good’ Charity Compilation; exclaim.ca: David Lynch Beefs Up and Releases Benefit Comp Featuring Tom Waits, Peter Gabriel, Iggy Pop; Pipoca Moderna: Alanis, Maroon 5, Iggy Pop e outros gravam CD para David Lynch, Examiner.com: Beatle friends, others band together for iTunes David Lynch TM compilation; Wirtualna Polska: Iggy Pop i Peter Gabriel medytują z Davidem Lynchem and Zobacz składankę Davida Lyncha; Music Feeds: David Lynch Releases Star-Studded Charity Album, Detroit Free Press; Monitorul de Suceava; OpenSpace.ru; Тренд; Day.Az; Look To The Stars: David Lynch Launches Music That Changes The World; Gear4music: Superstar musicians contribute to David Lynch’s new compilation album; ChartAttack: I Read The News Today… For July 14, 2011; Transcendental Meditation Blog: David Lynch Releases ‘Download for Good’ Charity Compilation; 20 Minutes Online: David Lynch fait ses débuts dans las musiques; Pitchfork Media; Plain Dealer: 9. CLICK TO LISTEN; Caller-Times: Complilation offers chance to meditate. The Independent: Transcendental Meditation: Were the hippies right all along? For years, it has been ridiculed as a 1960s embarrassment. Now Transcendental Meditation is back in a big way. So were those hippies on to something all along? Remember M-People’s 1995 Top 10 hit instructing you to “search for the hero inside yourself”? A decade-and-a-half on, it seems that things have changed – these days, it’s not so much a hero as a guru that many of us are hoping to internalise. For strange as it may sound, among those of us who seek to surf the zeitgeist, the most fashionable thinker of 2011 may turn out to be Maharishi Mahesh Yogi, the founder of the Transcendental Meditation movement – and the fact that he passed to a better place in 2008 doesn’t appear to have discouraged us one bit. TM, as its followers call it, is rapidly moving from kooky margin to respectable mainstream thanks largely to a burgeoning body of scientific research which indicates that regular meditators can expect to enjoy striking reductions in heart attack, stroke and early mortality (as much as 47 per cent, according to one study). And the apparent benefits don’t stop there: according k to a pilot study just published in the US journal Military Medicine, veterans of the Iraq and Afghanistan wars showed a 50 per cent reduction in their symptoms of post-traumatic stress disorder after eight weeks of TM. Meanwhile, educational establishments which introduce a “quiet time programme” – as did Visitacion Valley Middle School in San Francisco – report drops in fights and suspensions, increased attendance and improvements in exam results. In this country, the Maharishi School in Ormskirk, Lancashire, gets glowing reports from Ofsted and achieves exceptional academic results. An estimated four million people now practise TM globally – 20 minutes twice daily, as per the Maharishi’s prescription – many of them over the course of many decades, and there are some famous, and rather surprising, names on the list. Clint Eastwood, for example, has been doing it for 40 years, a fact he vouchsafed via video link at a fund-raising dinner for the David Lynch Foundation, an organisation set up by the film-maker to teach TM to school children, soldiers suffering post-traumatic stress, the homeless and convicted prisoners. Other celebrity adherents include Paul McCartney, Russell Brand, Martin Scorsese, Ringo Starr, Mary Tyler Moore, Laura Dern and Moby. TM reaches far into the rational and sceptical world, too; the American philosopher Daniel Dennett does it, as does Dr Jonathan Rowson, head of the Social Brain project at the Royal Society for the Encouragement of Arts, Manufactures and Commerce (RSA) and a chess grandmaster (more from them later). Now a psychiatrist with 30 years’ clinical experience, Dr Norman Rosenthal has written a book, Transcendence: Healing and Transformation through Transcendental Meditation, which gathers all the available evidence for TM and urges healthcare professionals to offer it to patients suffering from mental illnesses ranging from mild depression to bipolar disorder. While the research on the health benefits of TM is fascinating, there’s another, more compelling, reason why meditation is in the air just now. Done consistently, it seems to offer some sort of corrective to modernity, a respite from anxiety and the ability to really, truly relax, without chemical assistance; a break from our constant, restless and often doomed aspirations to be thinner, richer and more popular on Facebook; the welcome discovery that happiness is to be found not in retail therapy, but within. Those spiritual cravings explain why Rosenthal’s book is now riding high at number 14 on America’s Publishers Weekly non-fiction list. And according to TM UK’s official representative, David Hughes, there’s a similar surge of interest on this side of the Atlantic; figures are vague, but he reports that “there’s definitely an ongoing increase month by month” to the estimated 200,000 people who have learnt TM in the UK since 1960. I first began to ponder the notion of meditation while writing a piece on solitude. While aloneness might not be a state that comes naturally to most humans, without it, mental-health experts believe, it is impossible to be creative or even really to know oneself. It was the sheerest coincidence that on the day I contacted TM’s UK website they were preparing for Dr Rosenthal’s press conference. Click on this link to read the rest of the article: http://t.co/795LCEz. According to David Hughes, TM is a not-for-profit, charitable and educational foundation which, once it has paid its teachers and covered its costs, ploughs its revenue back into outreach programmes in the developing world. It is certainly not shy about proselytising; but if its impact on public health is as great as Dr Rosenthal believes, one could argue it has a moral responsibility to spread its message. As for me, I’m seriously considering introducing my children to a stress- and anxiety-busting daily ritual that seems to do no harm and may well do a great deal of good. A nicely edited version of this article was posted Tues Jul 12, 2011 in the Times of Oman: In search of a quiet time.